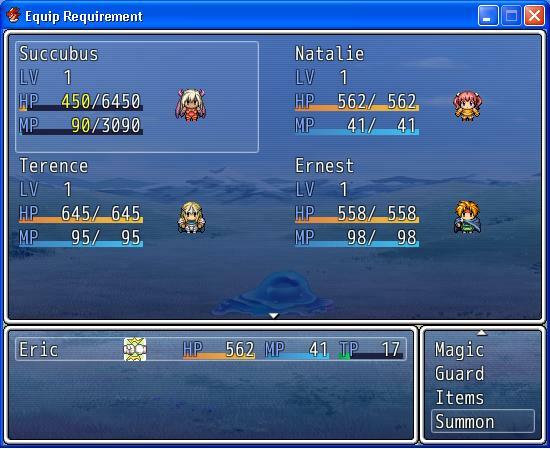 By Tsukihime, May 18, 2012 in Completed Scripts/Plugins/etc. 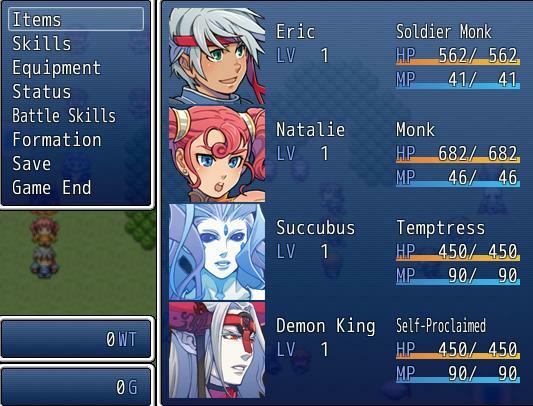 This system allows you to capture monsters and recruit them as actors. When a skill or item with "capture effect" is used to defeat the enemy, there is a chance of capturing the enemy. Compatible with Skill Select: just setup your enemies the same way you would with actors. This script must be placed above it. To give it x% chance of capturing. Integers only. When you defeat the monster, you will be brought to a results window with the monsters you captured. Pressing OK will accept that monster as a new ally. Pressing cancel will ignore it. You can press left and right to scroll through your captures. Configuration settings at the top. Default capture skill is "attack" skill. Can specify multiple skills with capture effect. This is hardcoded as an array right now, but eventually it will be an actual feature that you can assig n with note-tags and other things. The window is a little plain right now, but eventually it will look like a proper recruiting window. 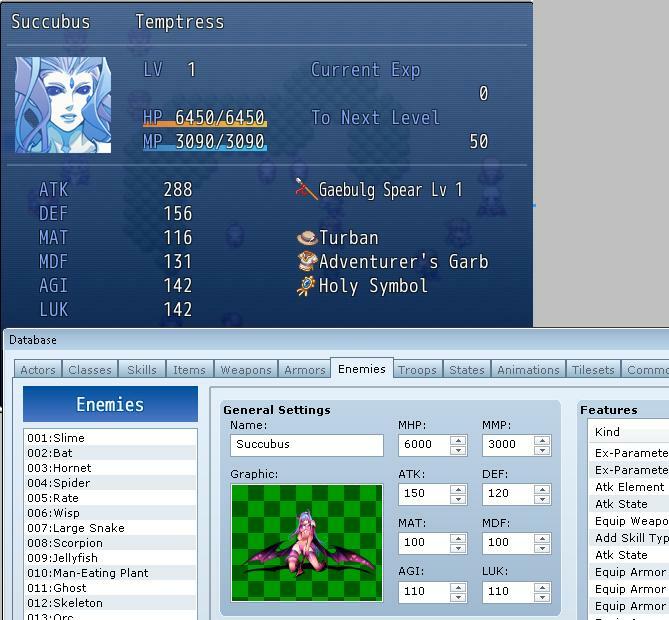 The following image shows that enemies can be set up right in the enemies tab, and (eventually) all of the stats/features will be transferred over to the actor. As part of my experimental features I decided to add support for custom enemy faces and classes. Right now I'm letting you specify a custom class name, but I'm thinking of forcing you to choose a valid class from the list of classes. Either way, all of the features will be transferred from the Enemy feature list to the new actor's feature list so you can just treat the enemy as your actor setup. The face image is the one stored in the Graphics/Face folder and the index is the index on that image. From the look of it, it could be good for those people who wanted to make pokemon games... Yanfly's party scripts mixed with this (assuming there's no conflicts) I can see making that work quite easily. wow monster capture system.. !! Wow, that's real cool. Since I'm at school usong a MAC and I can't play the demo, I have some questions. What is the process for catching a monster? Can it happen on the map or through battle? Both? 1: do you have battle captures? "battle captures" is named poorly. Instead, it should be just "captures" in general, since you could obtain captures via events (eg: you complete a quest and someone gives you a monster). For event captures, you just need to say "add_capture(enemy_id)" and it will automatically take you to the capture scene. I'm planning on extending this so that you get a notification and you can choose to go to it if you want. Capture rates / chances (if health is higher than 50% then you have less chance to catch and it'll not be caught, stuff like that). Can also have states influencing it, like sleep, poison etc; increasing the success rate. Yep, I'm basically linking this script directly for a pokemon game XD though it does have many other uses. Maybe add an "egg" feature to hatch monsters too? Just thinking. Nice script. Script updated. I've made the recruit window a little more interactive. I'm planning on cloning an instance of the Enemy object and modifying its parameters before I add them to the capture list. This allows you to customize details about the enemy. Obviously pirates capture other pirates and use them as hostages. Though I imagine you could use a pirate recruiting system where you arbitrarily hire new crew. Since custom data is now possible I can go ahead and work on my actor creation system. The capture rate will use a formula based on both the user's params/state (eg: luk), the skill/item's capture rate, and enemy parameters and states as well as capture rate. Though, anyone want to come up with the formula? The enemy parameters in the database will serve as "base stats". Though there may be scripts that alter an enemy's stats, so I'm not sure what I'll do with this. I don't think I'll be adding an egg feature to this script cause this script provides generic "capture" and enemy-->actor creation. Eggs are kind of something else entirely, even though you could technically receive an egg after capturing a monster. Anyway there can be a spell, that summons the monster you recruited, then it goes away after x turns. I've implemented it in my Battle Summon script. It provides an extension to Monster Hunter by adding all captured monsters to the Summon list. Then you can call them using summon skills. I've updated it with capture rates. Where x is some integer >= 0. this is the percent chance of capturing the enemy. No support for percent signs. Note that an enemy must *die* in order to be captured, which is pretty bad design. The last skill that was used to defeat the enemy is used to resolve capture. Wow, and I was just thinking about a few concepts with something like this! Thanks a ton! I'll be playing around with this! can you capture the same monster more than once at a time like in pokemon? Or do you need to release that monster before you get a new one? Also, does it count as a new actor so you might go over 999? There is no dupe check, though there probably should be an option to prevent dupes. There shouldn't be an issue with going over 999 actors. The database limit only applies when you're using the editor. I'm having a problem. I have tried modifying the script, but no matter what I try it always has a 100% capture rate. I tried changing the hard coded capture setting to 5 yet it still is 100% rate when ingame. The last line is the formula I used for calculating whether an enemy was captured or not. I'm not sure what a good default capture rate would be. The issue is that yanfly isn't initializing any of his RPG objects so when I create a new actor, none of those variables are there. It is simple to overlook, especially when you assume no new objects are being created. Hello i love this script and the whole idea of it but only one thing is really bugging me about it. Can you change a thing in this script? Have you set the capture rate for the monsters/skills? You can't capture multiple copies? You have just made my day with this script. Hands down, one of the best scripts in Ace. Go To Topic Listing Completed Scripts/Plugins/etc.